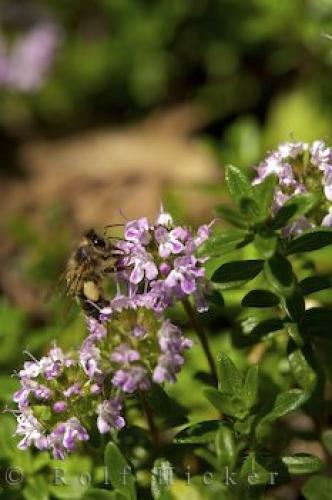 A bee collects the nectar from the flowers of a Thyme plant in the gardens of La Source Parfumee in Gourdon village in the Provence, France. Watching a bee busy at work on this flowering Thyme plant at the La Source Parfumee Gardens in Gourdon, France is an intriguing way to spend some time. As soon as the Thyme plant begins to blossom, the bee heads directly towards the flowers to start on his busy day. The Thyme plant grows to its maximum potential in well-drained soil and the direct heat of the sun. The vast amount of sunlight in Gourdon, France is one reason this particular herb plant flourishes at the La Source Parfumee gardens amongst many other culinary herb plants. the village of Gourdon in the Provence, France. The Thyme plant has been around since long before the Medieval Ages and was once used for embalming, incense and other fascinating purposes. Today, it is still a world wide used plant for things such as cooking, perfumes and medicinal needs. A bee on a Flowering Thyme plant, Thyme sarriette at La Source Parfumee Gardens near the village of Gourdon, Gorges du Loup, Alpes Maritimes, Provence, France, Europe.